Thought it was a really enjoyable read. Lots of intrigue, great characters and a great plot. Am eagerly waiting for the next instalment, I need to know what happens next! Great debut fantasy novel. The city is described in such a way that it really does become a central character itself. It's dark storyline is seamlessly interwoven with humorous banter and biting satire. Can't wait for Englands next novel. A must for any fans of the fantasy genre. This is going to be a tricky review to write. It’s one of those that I have to break down into two parts: theory and execution. Theory, being the story itself, the plot, the characters, and the setting; whereas execution is the actual writing.Theory, which I’m also going to call ‘the good’ stuff: I liked this part of it.I thought the setting was interesting. I wouldn’t have minded a little more world building in some details, mainly pertaining to history/why things were as they were, but otherwise I got a good feel for the setting.The characters were reasonably relatable. Cassie, as pretty much the only female character of note, didn’t impress me as much as I’d have liked but she was all right. I’d have liked to have seen more females/stronger female characters, or a good reason why they weren’t there from the setting but it didn’t bug me that much. I would have liked the Harth/Theal rationale (at the very first) to have been a little stronger, but again, didn’t bother me that much. A few other details here and there explained or strengthened, but nothing major. (And these things might have been there. I might have missed them, for reasons explained in the execution section. )Generally speaking, the plot was interesting and moved along well. The Husk thing was an interesting twist. As it was “to be continued,” I can’t speak to how the story wrapped up, since it, you know, didn’t wrap up. But I didn’t mind that either. (Poor Clarke, though, that man has no luck. )Execution, which I’m also going to call ‘the not so good’ stuff: This was my problem.This was a good story terribly hindered by its frame. This was a book that clearly didn’t see any editor, or if it did (which is doubtful) anyone that was willing to do to it what it needed. It felt like a first draft more than a product ready for release, and that hindered what was otherwise good.I don’t let basic proofreading issues affect my rating, but I do when it’s big issues with the prose itself. Sentence structure was muddied, so it was hard to follow along with what was being told at points. It was a bit overwritten, especially in terms of dialog attributions and actions being over-exaggerated. There were a lot of excess words, it could’ve benefited from streamlining as well as fixing passive voice at points. PoV could be convoluted, though I think the author was going for Omniscient. With some clean-up, this would be clearer, too.The story was difficult to read because of this, so I may have missed points of the plot, though I think I got most of it.My inner editor was just bouncing all over in my head reading this story, because I could see that it was good and I just wanted to grab the text and wrestle it into form that would make the story shine rather than hide it.I would give the story a 4, but the prose a 2, so that settles an average of 3. I might read the sequel, because I am very curious, but I hope that it’s a little easier to read. Check out my blog to see Reviews of Books and Movies as well as Recipes and DIY projectsI received this book for free in exchange for a fair and honest review. Mirian is written by D.S. England. 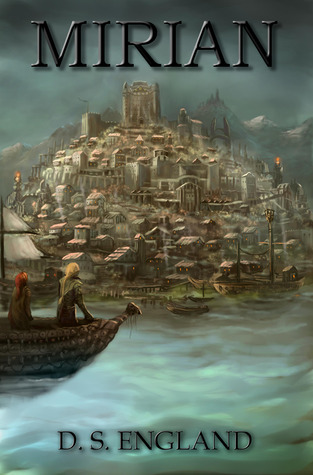 It is book about the port city of Mirian and the people that reside there; mostly The Watch, the mercenary Talon, and other various riff-raff characters here and there. England did a wonderful job of setting up the story, there is a lot of action going on and the the story definitely has a dark, almost desperate tone. The reader can connect with the characters and truly feel their struggle. All main characters are well defined and described and I loved how there was a great all-around view of events from many different points of view. This was written with a great fluidity so that you did not feel lost with the change in view point. Mirian definitely hits the ground running with instant intrigue and betrayal. There are definitely many desperate moments, and also moments of singular character development and personal perseverance. I definitely did not see the way the "plague" aspect was going to play out and thought that it was well-imagined by the author. I liked Seline the most, although she wasn't one of the main characters, and I liked to be in the mind of Theal, even though it came with many unexpected surprises. The book does a great job of capturing the frantic situation that each character finds themselves in. Captain Nathan Tam, definitely is a great example of an honorable man faced with a desperate time. The main detracting forces for this story are the same as most books I have read of late... Typos and grammar issues. In addition there were also several formatting issues in the Kindle format where a sentence would stop in the middle and big up tabbed down in the beginning of a new paragraph. Overall I thoroughly enjoyed this book despite the distractions. I give the story a 4/5 stars, and would love to see a cleaned up version to earn the 5 stars this book can easily obtain. Mirian ends with the intent on another installment into the series and left me with curiosity and yearning to know what is in the next story. I will definitely be reading book two. If you are into intrigue, betrayal, mystery suspense, action, character development, darker themed books, paranormal/fantasy, than this book is definitely for you! The premise seemed so promising, and at the start we are tossed into a battle which leads to the mystery that runs as a central theme of the book. The characters spend most of their time running from one battle to another. We barely learn of anyone's true motives, or what they really hope to accomplish until 3/4 of the way through.The setting is meant to evoke a fantasy world, but I was left feeling unsatisfied. A few scenes I would feel hit the mark, but then other parts felt too modern. Also, the dialogue is riddled with cliched, trite phrases, over used words, and the bizarre inclusion of 'whilst', which is at odds with the rest of the speech. I can only surmise to try and make it feel "fantasy" and "Medieval. "The mystery is never fully solved, nor explained, nor in fact, what the whole purpose of the main, (naturally) mysterious evil man's intentions are. I struggled with my boredom, hoping it would get better, but it never did. Also, for the love of good writing, please, please, please get a decent editor, and some beta readers before you publish again! The potential was absolutely ruined, what should have been a good read instead failed. I was left with the feeling the whole book would have been better off if it had been a first draft and not the final. Clearly the author intends this to be a series, but it left me wandering where the real start of the series was. This was not the book for me. I gave it four stars because it was pretty well written, not because I personally liked it. What really turned me off about the book was all the blood and gore, plus the fact that even the good guys were mostly only slightly good. The whole book depressed me, so I won't be looking for any sequels. Loved it!Clearly supposed to be an ongoing series given how it ends and I cannot wait! The characters and conversations are so fresh and realistic it quickly made me feel and care for them. The world was also a nicely done really felt the run down nature of the city.Lots of intrigue and twists. looking forward to more from this author! For a first book, it's spectacular. Well formed, multidimensional characters rub against the gritty and harsh world around them, to produce a thrilling and fantastical story that is so well grounded that you believe it wholly and completely. Cannot wait for the next installment. D.S. England is one to watch. The characters are loveable and relatable. England's descriptive Text made me feel every shiver of the winter wind, each ounce of dread felt by the characters and their rare moments of happiness and elation.For a fantasy novel, this is such a light, easy read I would HIGHLY recommend to fans and non-fans of the genre alike. I'm just starting chapter 3 and I am hooked. I love the character and scene desripton in this book so much that I don't need to wait till the end to know that its gunna get 5 stars from me. I was given this book as an ARC in exchange for an honest review. In no way did this influence my review. Turmoil plagues the city of Mirian. The Watchman, or local police try to keep the city under control. They are working closely with the Talons, who are brutal hired hands working for the Count, the city's politician. There is internal conflict between these two groups, and even larger conflicts facing Mirian. Mirian is easy to get caught up in right from the start. The story line is full of intrigue and the relationships between the characters, and overall character develop is excellent. One of the characters, a wayward son of one of the watchman, adds even more twists to the plot. The back story on the characters was delivered through even the most action packed of scenes. This genre isn't typically something I read, but I didn't find myself enjoying this book. The cover of the book is excellent, and really beautiful. The overall storyline, and development of the characters was also great. What I didn't like : perhaps its because I don't read a lot of fantasy genre books, but I noticed quite a few areas where the story sort of fell apart in terms of realism. I am curious as to whether I just didn't catch these parts because I was distracted by the language, and other things going on in the book or if it was genuinely left out, to be addressed in part two. (Will there be a part 2?) if there isn't going to be a book two, it will leave so many unanswered questions, and frustration for the readers. Some of the grammar needed work, but then again, this is a self published book. I am also a self published author, and the hardest thing to work on is grammar and passive voice. On my debut novel, I got dinged for it all the time. I fell like in this instance, the writing is good, but could be so much better if the author sent this out to Beta readers before publishing. In my experience, the beta readers tore my story apart, for the better. Overall, I would give this 3.5 stars. It was a great read, even though it was a little distracting with the grammar and plot issues. I would highly recommend the author work on these small things and republish. I think that this book could easily be 4-5 stars after the changes are made. Great debut novel from this author. I look forward to reading more of his work!! This was ARCFirst, I must say that I had very big expectations, and I was struggling almost the whole book to see what is really going on there. The Plot was very good, but something just didn't feel right. I would say that It was the lack of Experience, and that the writer didn't have a (grammar and other) help, or that he didn't Listen. The first 50% of the book, I just didn't get what was going on (at the same time, there was too many (unimportant) and too few (important) informations), what they are all doing there, and why. After that, it was a bit easier, and in the end, I could even say that I know what was happening in last few chapters. I hope that the author will write 2nd book, but I really hope that he will find someone who will help him to stick to important facts, and doesn't get lost in details, before he publish it. I was given a copy of Mirian in exchange for an honest review.This story had the potential to be a good story. However, there were many grammatical errors that kept me from being able to really get into the story and I found myself skimming through just to finish. Part of the problem was the way the POV changed sporadically and for no real reason, making it really hard to keep up with all of the different characters. There also seemed to be many little points stuck in there with no real reason. There were also many run-on sentences that should have either been broken down in to at least two sentences or commas should have been used. I think if the author could just fix these things, it has a potential to be very good. I was given a free copy of this book in return for an honest review.Miriam is a the story of a city in turmoil. The men of the Watch are charged with protecting the city of Miriam. Magic and mayhem put the city and the men of the Watch in peril. There were several grammatical errors and typos which distracted me from the story. The book also ends with several threads unresolved. I assume that these will be resolved in a sequel. This is personal preference, but I prefer that each book in a series is a complete story that is a part of the larger whole. That said Miriam is a great read for lovers of fantasy and horror. I think with a little polishing this could be a great book. D.S. England - I never know where to begin with 'about me' sections so I usually sit staring at the screen wondering if one more coffee would help but this time I'll just start with the basics and see where it leads!I was an army brat born in the 'radical' eighties and have been writing for as long as I can remember. I tend to lean toward Horror, Sci-Fi and Fantasy but I tend to come up with an idea, write it then worry about what genre it needs to be stuck in after.